Some mothers are now convinced that a real diaper bag is much better than an ordinary purse or backpack. It has more pockets to carry needed baby items in an organized manner. You can easily access important things like a pacifier or wipes in small outer pockets. Some diaper bags also come with a detachable diaper and wipe clutch. What other factors should you consider in a good diaper bag? The first thing to consider in a good diaper bag is the functionality. It should support your needs during days out, night trips, and when your little one throws tantrums. Functionality includes all the spaces for baby essentials like diapers, wipes, milk bottles, sets of baby cloths, pacifier, etc. But aside from space for baby stuff, it should also have space for your essentials; with space for keys, wallets, phones, etc., you won’t have to use a separate bag. The second thing to consider is the style. Diaper bags come in different styles and colors. A bright colored diaper bag shows off personality while neutral colors complement men’s outfits and are more likely to be used for other things after the baby has grown. Another thing is the size and weight, which is often overlooked. The diaper bag should be big enough to accommodate all baby stuff, but not be too big because as the baby grows, you need less when going out. Overwhelmed with too many varieties of diaper bags? Here’s a good one: the CoolBell Baby Diaper Backpack. It has many pockets including 2 waterproof front pockets for diapers, 1 side pocket for tissue, 2 side insulated pockets, bottle compartment with 3 insulated milk bottle pockets, net pocket for a towel, a zippered secret pocket for small valuables, and a main compartment for bigger stuff like baby clothes, toys, etc. 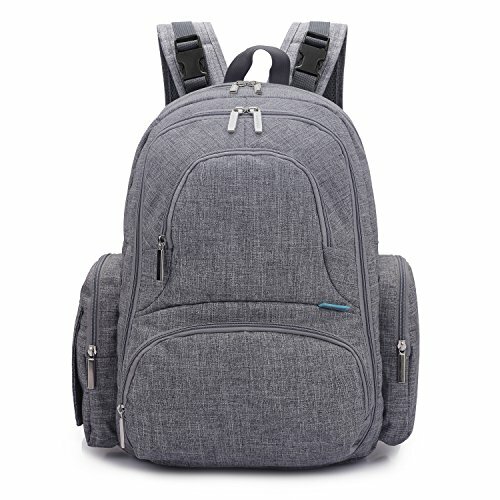 CoolBell Diaper Backpack makes going out very convenient, be it excursions, travel, running errands, going to the doctor, strolling in the park, etc. Some people are very satisfied with it. When the baby grows, this diaper bag can be used as a typical backpack, camera bag, etc. When it comes to pros and cons, CoolBell Diaper Backpack has more pros than cons. Functionality, design, size, and weight – these are factors to consider when buying a diaper bag. It should have many pockets where you can systematically store baby essentials. An insulated bottle pocket is also a nice feature to keep milk warm. Aside from baby items, you can also put your essentials such phone, wallet, and keys in the diaper bag. One of the most affordable and functional diaper bags is the CoolBell Diaper Backpack. It is made of high-quality nylon, polyester and other eco-friendly materials that make it durable and long lasting. It weighs 2.2 pounds and has a capacity of 26 liters. It comes with changing pad and numerous pockets for different baby essentials like milk bottles, diapers, clothes, toys, etc. The CoolBell Diaper Backpack is versatile and comes with stroller straps so you can hang it on your stroller when needed. It has a classic, grey colored design that can come with any outfit. It is convenient and comfortable because it has paddings on the back and shoulder straps. With these features and advantages, no wonder CoolBell Baby Diaper Backpack is a choice for many parents.